Today I’ve got some more silver beads from Star Bijou. The engravable Star Drum (€58) has some sweet stars along the rim. I chose the engraving ‘Make Music’ as music has always been an important part of my life. It’s allowed me to travel places, meet some wonderful people and it’s how I met my husband, when we were both members of the Thunder Bay Symphony Orchestra. The drum is especially meaningful to me as our eldest son is developmentally disabled and at his school, loves going to drum club, which is actually run by my husband! It’s the highlight of the week for both of them, so that’s what this bead will always mean to me. Here’s a video of what it looks like. 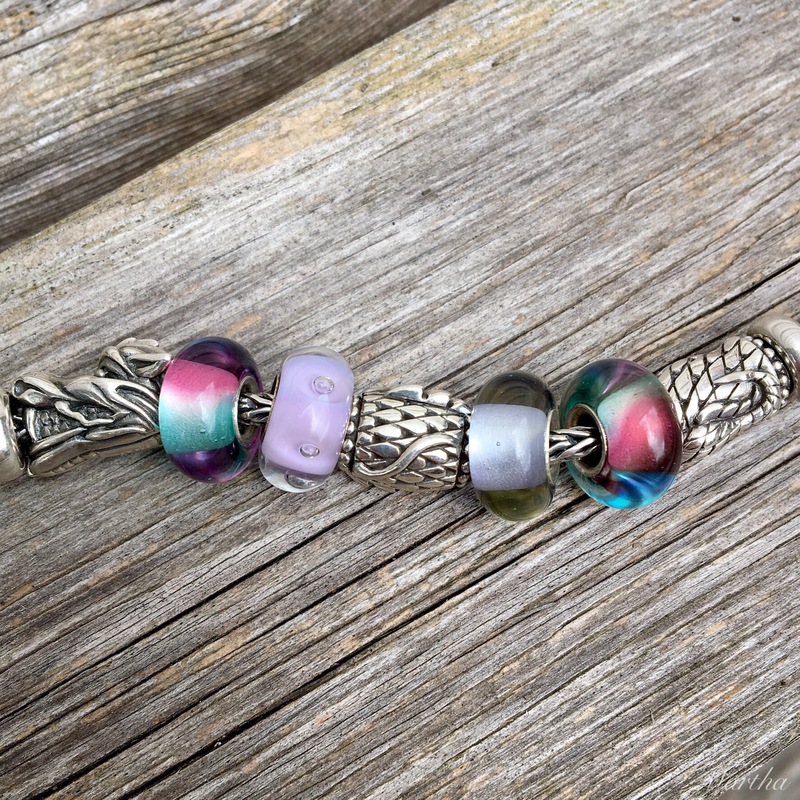 I made up a very colourful bracelet and used other silver beads from Star Bijou as well as Trollbeads glass. The Dragon parts (€42 each) consist of a body and tail. Again, there is a good amount of detail, with some raised parts. 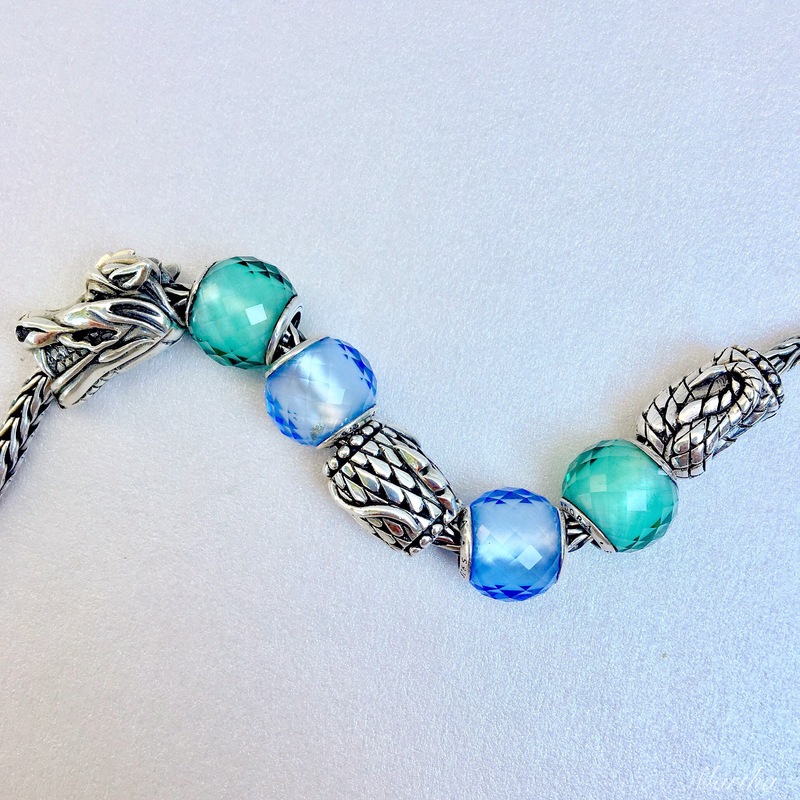 I continue to be very impressed with the quality of Spiritbeads! 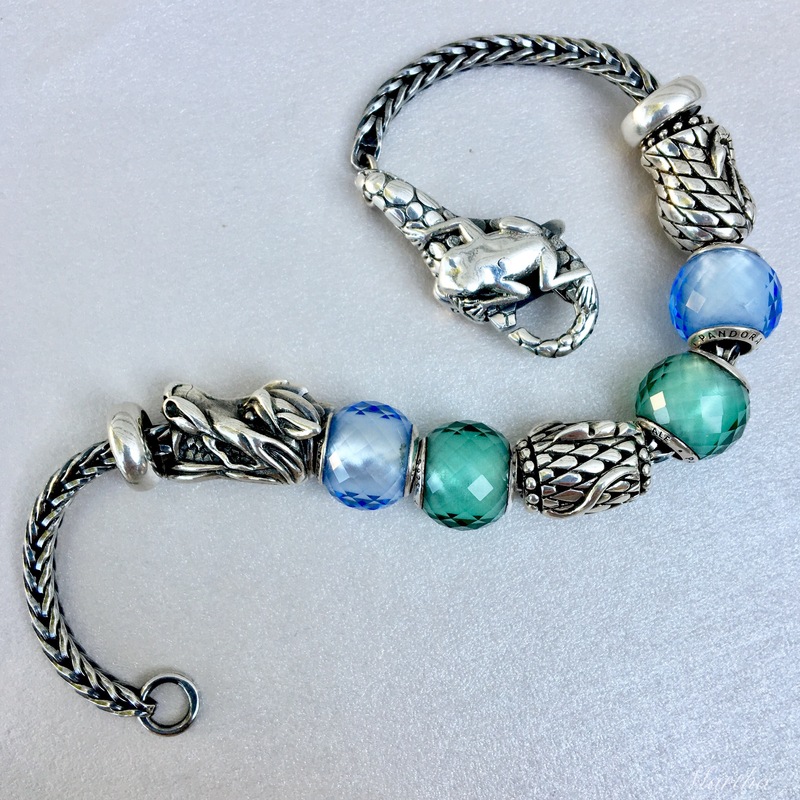 Here are the two parts with the Lucky Dragon head and some Melanie Moertel beads. Here’s a video of the middle part. And here is the tail. 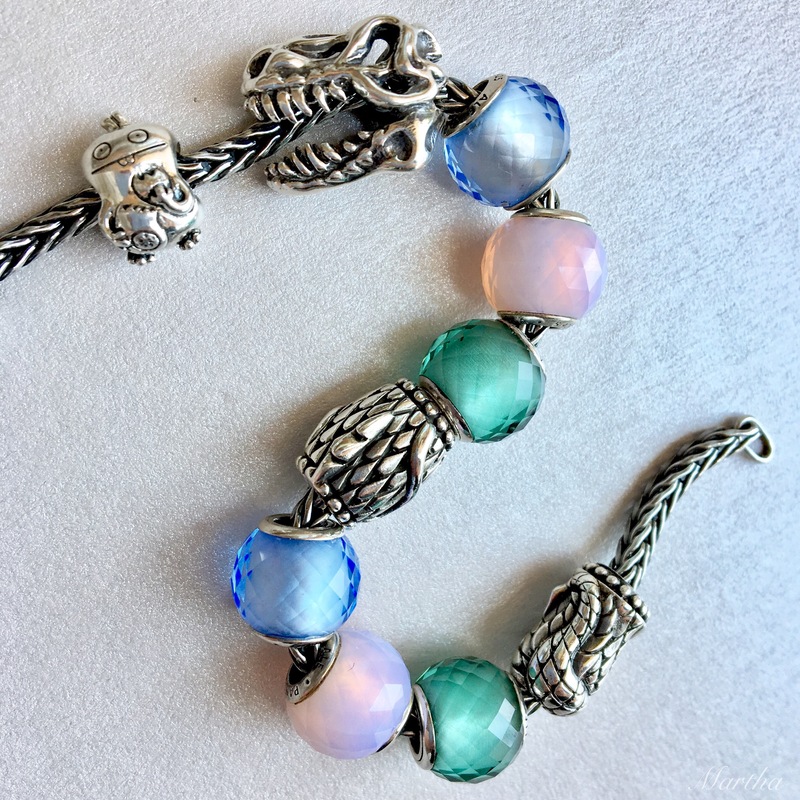 My preference for these beads is to use them with Pandora Petite Facets so that it looks like a sleek dragon. Surely some culture must have a tale about a frog and a dragon. You don’t even have to use the Lucky Dragon head if you don’t want to. Here I’ve used the Ohm Beads T-Rex to make the extremely rare Dragon-o-Saurus Rex. If one of these is chasing you, for goodness sakes don’t stop to eat cookies! That’s Babo from Ohm Beads, by the way. 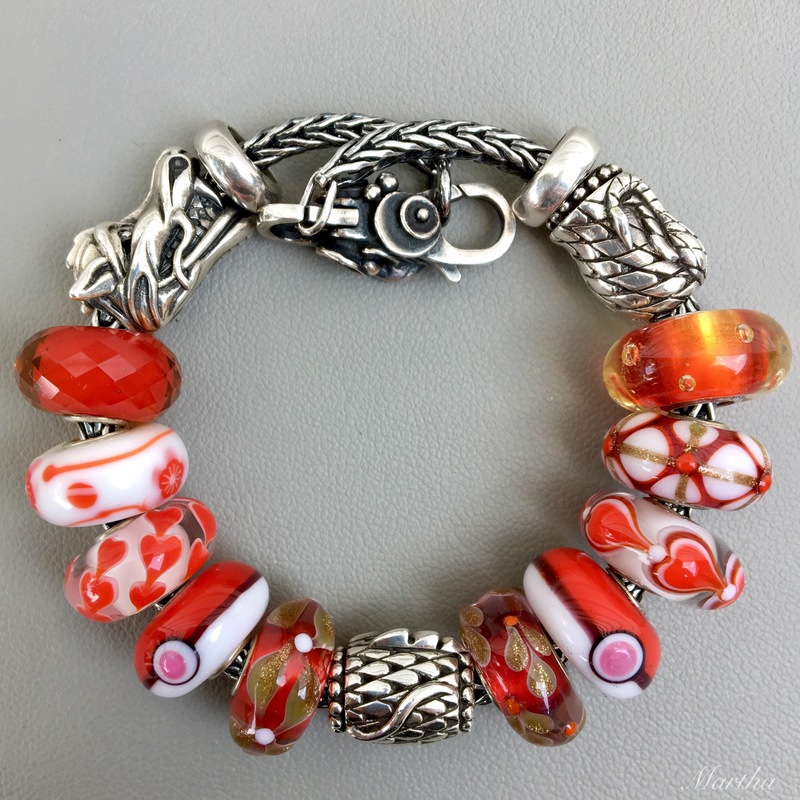 Obviously the sky’s the limit when it comes to making combinations with the dragon parts and I’ll leave off with a Trollbeads red and white glass combo. Hope you’ve enjoyed this look at some more Spiritbeads and do let me know if anything catches your fancy! Hi Martha, I’ve never seen the drum bead before. I’m sure it makes it all the more special for you because you have personal reasons for choosing it. My favorite bracelet is the one with the Pandora Petite Facets. I’m thinking maybe Babo needed the cookie for a quick energy boost since he’s all alone with a dragon. Hi Suzanne! Yes, Babo needs to start running away fast! Fantastic every way you’ve shown it! The colorful combination is wonderful, Babo needs to run -love the parts with the petite facets also, and the final red and white full bracelet is very authentic Asian or Chinese.with touches of gold. I think I’d like to explore that color combo (red/gold/white) with the dragon beads. I love your star drum and its engraving and ooooh Melanie Moertel beads, where do you see/buy those? Ooo, yes I love the idea of using the purple Petite Facets! I don’t have them, but on they go to my wish list now. Alexandra, there are so many fabulous beads now, aren’t there? The Spiritbeads are all lovely, I think! What a beautiful and meaning story for your drum bead. I love that it can be engraved! 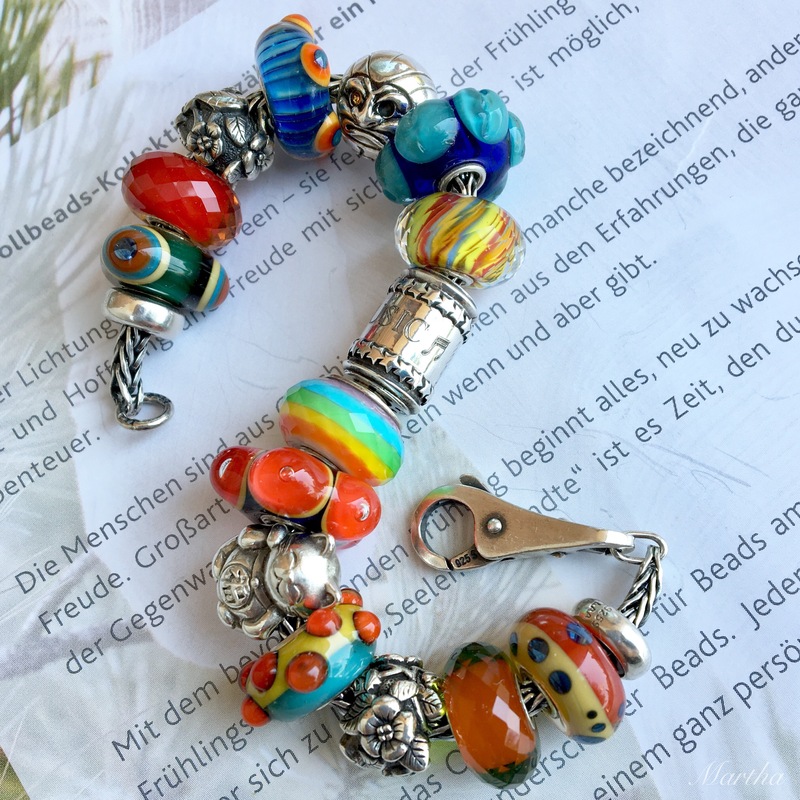 What an exciting way to add to the stories one can tell with beads! So true, Lizzy! It would also make a lovely gift for someone, too!